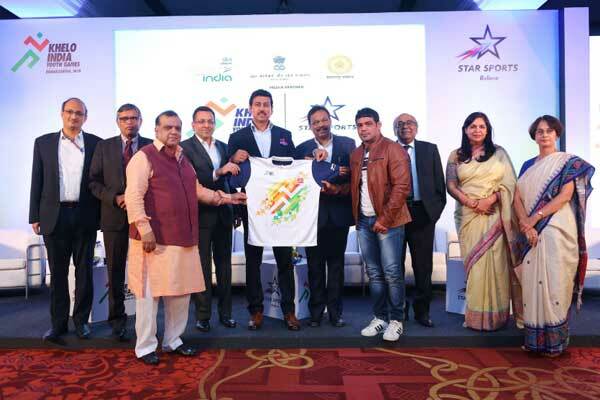 Union Minister Rajyavardhan Singh Rathore launched official jersey for the second edition of Khelo India, renamed as Khelo India Youth Games starting from 9th to 20th January 2019 in Pune. Seeing the huge success of the Inaugural edition, the Minister alongside Khelo India stars Manu bahker, Jeremy Lalrinnunga, Saurabh Chaudhary, Lakshya Sen and other started a countdown to the Khelo India Youth Games with a powerful #5MinuteAur Campaign. The Youth Games which is scheduled to take place at Pune based Shree Shiv Chhatrapati Sports Complex, is expected to see more than 10,000 participants from across 29 States and Seven Union Territories taking part in the games under two set categories- Under 17 and Under 21. In an attempt to make every day’s routine of school going kids, Khelo India in its inaugural edition has made its vocal “Kheloge Kudoge to Banoge Lajawaab” breaking an age old belief . The ministry of wants kids to infuse more 5 minutes in games through its #5MinuteAur Campaign. “The success of Khelo India School Games is a testimony to the hunger and multitude of sporting talent in India. Buoyed by the terrific response for Khelo India School Games and with an aim to increase participation in sports across all age groups, we have not just added two sports this year but the games will also be played under two age categories U-17 and U-21 to allow even more enthusiasts to participate and flourish. The ‘5 minute aur’ campaign for the Khelo India Youth Games 2019 to be hosted in Pune, Maharashtra is a reflection of the immense strides we’ve made and the journey that lies in front of us to make India a truly sporting nation. We hope it will inspire India to work towards incorporating sports as a way of life,” Rathore said. Bolstering the Campaign, Star India has come forward as a coverage partner of this major youth centered sports event. The youth games will be telecast across Star India network along with Hotstar.